The Horizon 202 is one of the few real panoramic cameras. 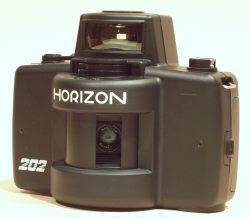 Made from 1991 to at least 2003 (accurate information about its production is hard to get), the Horizon 202 isn't really a classic camera. It is nevertheless peculiar enough to deserve a presentation. Manufactured in Russia by Krasnogorsky Mechanichesky Zavod (KMZ) and exported by Zenit, the Horizon 202 is the successor of the soviet Horizont of the 70s. Like its predecessor, it is one of the few truly panoramic cameras : it makes 24 x 58 mm pictures on standard 35 mm film with a 120° angle of view. To do this it is fitted out with a 28 mm f/2.8 lens on a rotative turret which sweeps through the field of view to take the shot. 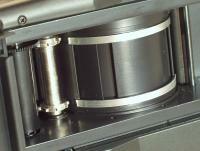 The film itself follows a cylindrical path. The Horizon makes thus an exact projection of the subject on the film, producing very different pictures than those made with a super wide-angle lens. The Horizon 202 greatly enhances the features of the previous models. It has three slow speeds in addition to the three rapid ones: 1/250 s, 1/125 s, 1/60 s, 1/8 s, 1/4 s and 1/2 s. The shutter (picture on the left) has three positions and the turret has two rotation speeds, making a total of six speeds. The fix-focus lens is set to infinite ; "focusing" for close subjects is achieved by stepping down the diaphragm to increase the depth of field. At f/16 all subjects beyond 1 meter are in focus. The very conception of the camera forbids the use of any flash. Made of metal set in an ABS body, the Horizon 202 is quite different from traditional russian cameras : its look is not repelling and it is carefully designed. It is sold with a carrying bag, a handle and three filters (skylight, neutral grey and yellow-green). Quality control has the reputation of being very bad, so be careful when buying one. Despite its unusual operation, the Horizon 202 is more than a mere curiosity. It is a useable camera which allows, with some practice, to achieve very interesting results. I hope the samples below will show this. The Horizon 202 can be taken anywhere due to its lightness and compacity . Short speeds allow to use it handheld while long speeds open the way to night shots. The very clear viewfinder (picture on the left) covers a slightly narrower field of view (110°) than the one actually taken and displays a useful spirit level. The overall ergonomics are quite poor. Film loading is a real challenge. The rewind lever is small and hurts one's fingers. The film has to be rewound slowly and gently or it will stick or even break. For the same reasons, the film advance lever must be used very gently. The release button goes off all of a sudden, shaking the whole camera. The camera must be carefully held since fingers are easy to put on the picture. A little trick to ease the film loading : bend the film extremity sharply at a 90° angle on a 5 mm length, it will follow its path much more easily. It is nevertheless a very good buy for those who want to try real panoramic photography. The sound of the lens while it sweeps through the field of view for short speeds (from 1/250 s to 1/60 s). The sound of the lens while it sweeps through the field of view for long speeds (from 1/8 s to 1/2 s).